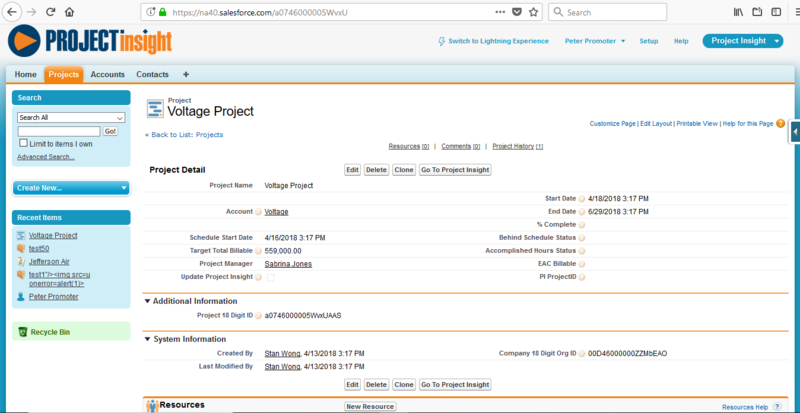 The Project Insight Integration App is designed to transfer project management information from your Salesforce org to your Project Insight account. This will help assure that key information about each project is consistent between the two environments. When the app is installed, it will provide the ability to track pertinent changes that are made in SFDC and upload them into PI. 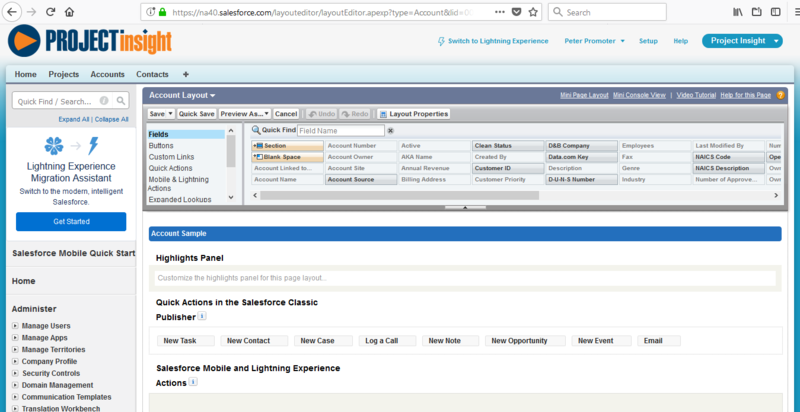 Similarly, key information about the Project, Account Resources and Comments can be integrated into your SFDC org. Use the most recently created URL to install the package into any organization. Contact Us to get the latest link. When prompted, Log into the org where you want to install the app. Follow the steps. Be sure the Project Insight System Administrator is one of the installed users. After the app is installed, it will be launched, and you will be able to see the Projects home screen like the one above. Please see the addendum to view the Project Components which have been added to your existing objects. What changes need to be made to your org. 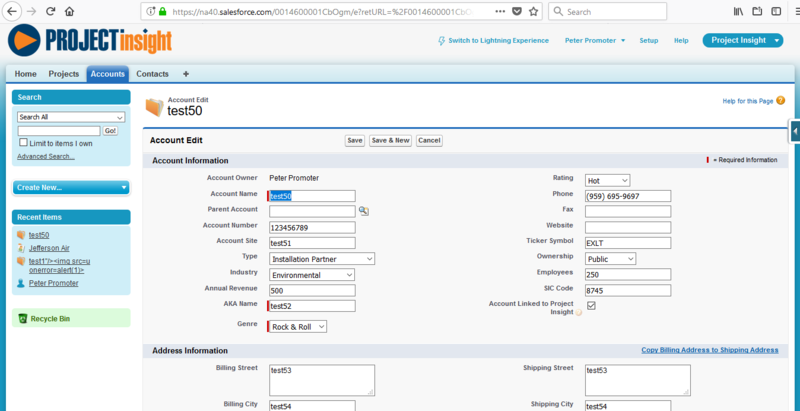 Project Insight Custom Settings must be configured with a check in the PI Outbound Msg Authorized box and a URL unique to your company provided by PI. Add the ‘Account Linked to Project Insight’ checkbox to the Accounts Page Layout. This box needs to be ‘checked’ for the Interface to pass the following Account information to PI for linked accounts. Add the ‘Contact is Active on Project Insight’ and ‘Contact is Linked to Project Insight’ checkboxes to the Contacts page layouts. These boxes need to be ‘checked’ for the Interface to pass the following Contact/Resource information to PI for linked Contacts. 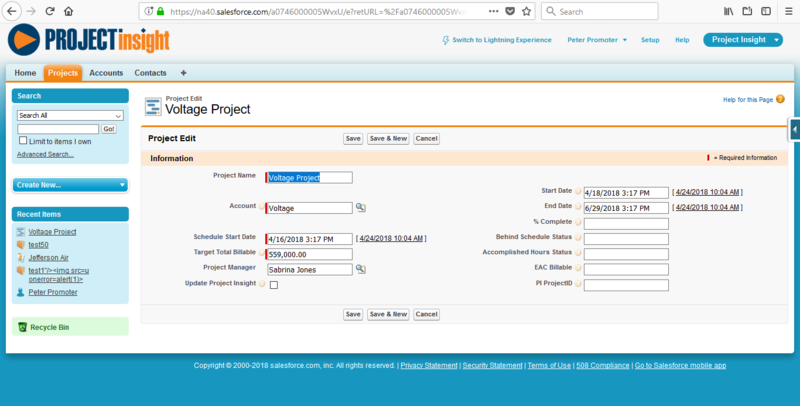 Project Insight Custom Settings must be configured by your administrator with a check in the PI Outbound Msg Authorized box and a URL unique to your company provided by PI. This will be assigned by Org (OWD). 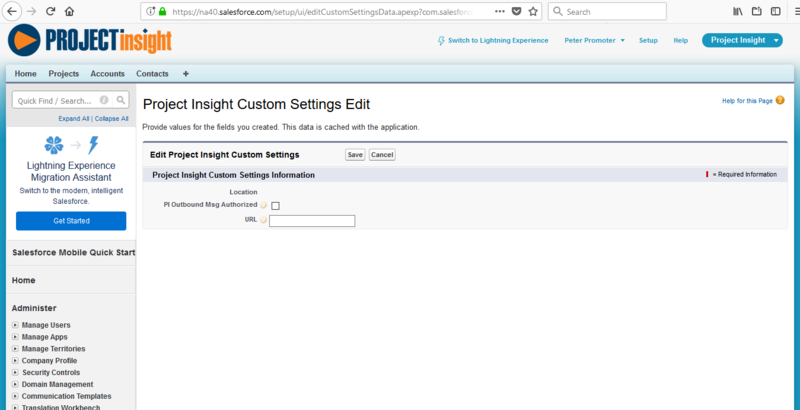 This is done by Selecting 'Manage' for the Project Insight Custom Settings and then New on the Settings page. This will open access to the organization. Check the box labeled "PI Outbound Msg Authorized" and insert the URL provided by Project Insight without using http or https in the settings URL. Just the address, such as myurl.projectinsight.net. The Checkbox will allow the user to send outbound messages to PI. 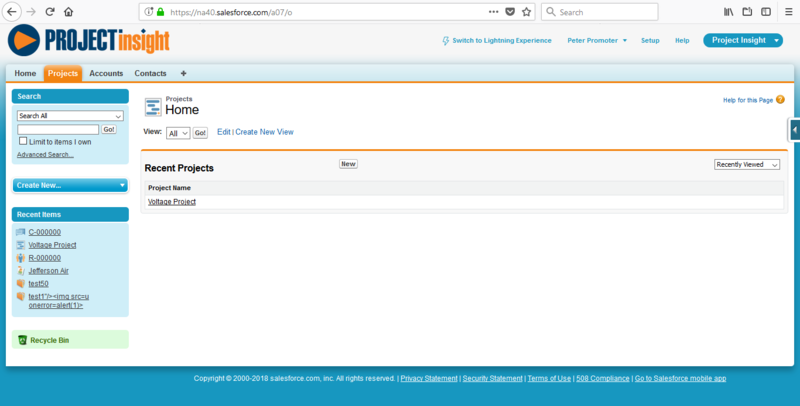 The URL will direct you to the projects in PI directly from that same project in Salesforce. 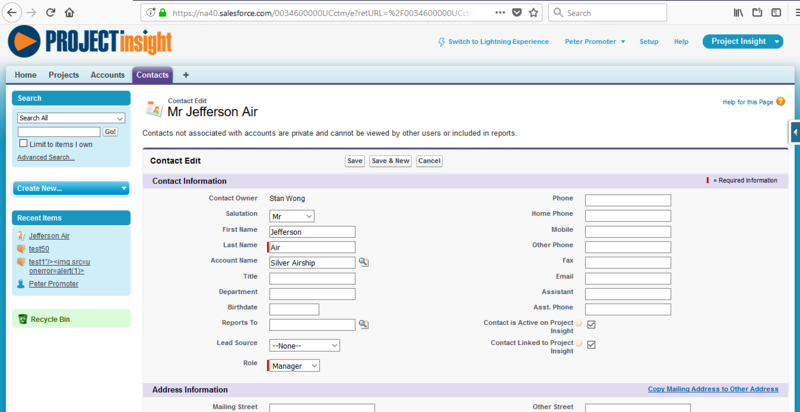 Before entering Projects, the Accounts and Contacts must be activated and linked. You are now ready to associate projects to PI. Enter the required fields on the left side of the screen. The Account picklist will display the accounts which have the ‘Accounts Linked to PI’ box checked. Similarly, the Project Manager pick list will display those Contacts which have the 'Contact is Active on Project Insight' boxes checked. When the 'Update Project Insight checkbox' is checked and the record is saved, the following fields will be sent to PI. You can edit the record without send information to PI by leaving the 'Update Project Insight checkbox' unchecked. Please note the 'Go To Project Insight' button the upper quarter of the page. Selecting this button will launch a web PI login page so you can navigate to your PI Project. Resources object pages can be accessed via the related list on the Project Screen. The Project must be an existing PI project. The Resource pick list will display those Contacts which have the 'Contact is Active on Project Insight' and 'Contact is Linked to Project Insight' boxes checked. 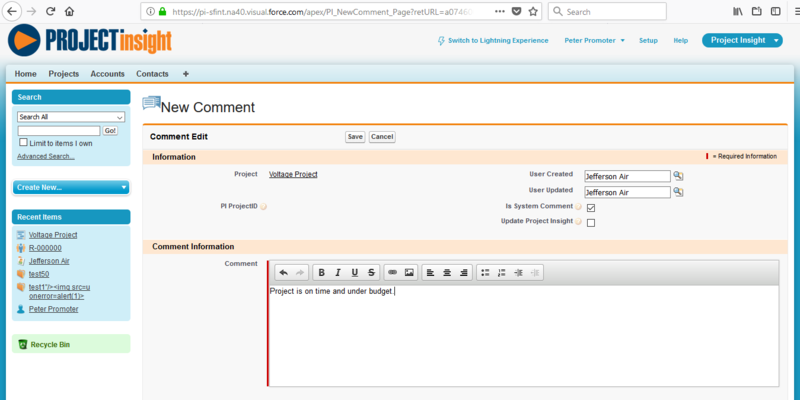 Comments object pages can be accessed via Related List on the Project Screen. The Project must be an existing PI project. 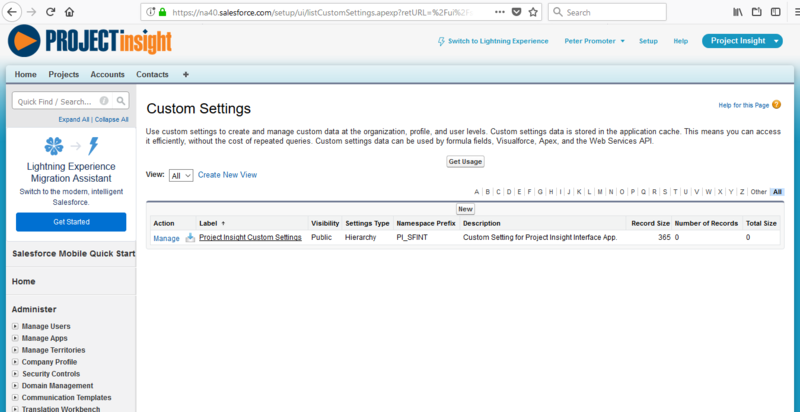 The User Created and User Updated entries must be on the Contacts object with 'Contact is Active on Project Insight' and 'Contact is Linked to Project Insight' boxes checked.